Everybody wants their perfect home, or at least as close to perfect as possible. Statistically, the majority of time spent by individuals and their families is in their home. Furthermore, the average length of time spent at a residence is about 5 years, but unexpected things can happen. There may be a career change, a family can outgrow their current living space or simply your views of the surrounding neighborhood can change. Choose the upgrades you would be willing to pay for in your current home. Consider your current work situation. If you currently work close to home, moving may not be the right choice. Some people believe that moving is an easier option however it may not be practical. Buying a home can be a long process with many costs that people overlook. Remodeling can also take some time and money, but you will not have to worry about packing and unpacking all of your personal belongings. Plan for the unexpected when renovating. Underlying issues in your home may be found once construction begins. 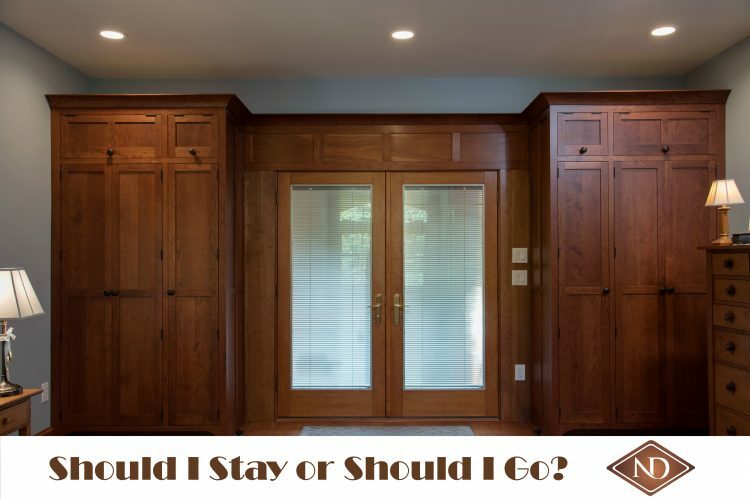 So, as you see, there are many factors to consider when deciding whether to move or remodel your home. Although your home may not meet your exact needs, do you like the neighborhood? Is this the right school district for your children? Is it close to work? If you answer all of these questions in a positive manner, stick around and remodel your home to your liking. Combining all of these factors together, it’s possibly cheaper to remodel your current home. Definitely compare costs before making your final decision. Most remodels don’t bring back a full return. Some bring back 80-90% while others barely cover half of the expenses. If you move however, will you be there long enough to recoup the costs of a new mortgage and moving? Your property may be so small that an addition to your home is out of the question. If your family has outgrown your current space with no room to expand, then it’s time to consider moving to a larger living space. Pack up your things and get ready to move. Some people have unfinished spaces to expand on their home or have enough room inside their house to redesign their home. Neighbor’s home value vs your home value? Remodeling your home can impact your home value. While you may not see a 100% return on investment, some projects can have quite the impact on your home value. If you are the sole $500K house in a neighborhood of $250K, it may not be as appealing to potential buyers. In turn, you may not yield the return you would expect when selling your home. If the surrounding homes are worth more than yours, a remodel could bring you up to par with the rest of the neighborhood, increasing your home value. Do you see yourself moving in the next 2-3 years? Would it be worth committing to a remodeling project if you won’t be living there long enough to enjoy it? If this could possibly be your home for life, then get started on that remodel, and have it meet your exact specifications. In summary, if you love the area you live, improving with a remodel makes sense. However, if a new location is just what you need to refresh your outlook on life, then trading up may be the way to go. Each option has its advantages. It all comes down to personal preference and what is your current financial situation. Don’t rush your final decision. Make sure you can afford to either move or remodel, and have the patience to deal with a remodel going on in your home or dealing with the hassle of moving into a new home.